Ireland is a picturesque country seeped in a long rich history. For Spring Break 2018, Ferguson students through Flight Club, Mr. Andion’s classes, and Ms. Toledo’s classes were able to visit and immerse themselves in the unique culture and beautiful destinations Ireland has to offer. Mr. Andion, the sponsor of the trip through his social studies classes, raves about its success. “Not all classrooms have four walls and it’s not where you travel, it’s who you travel with,” Andion says, emphasizing the purpose of the trip as being an opportunity for students to take what they learn and apply it to the real world. For seven days students visited major cities, small towns, and tourist attractions including Dublin, which Andion describes as a “modern hectic city.” Additionally, they visited Galway, Blarney Castle, and the Cliffs of Moher among other destinations. According to Andion, students were granted a level of independence that allowed them to explore and experience part of the trip on their own in order to create a more authentic traveling experience comparable to what many students may encounter in their life after high school. “It was for the experience: leaving the country and meeting new people.” Freshman Gabriella Rodriguez said. Gabriella attended through Flight Club, this trip was her first out of the country. 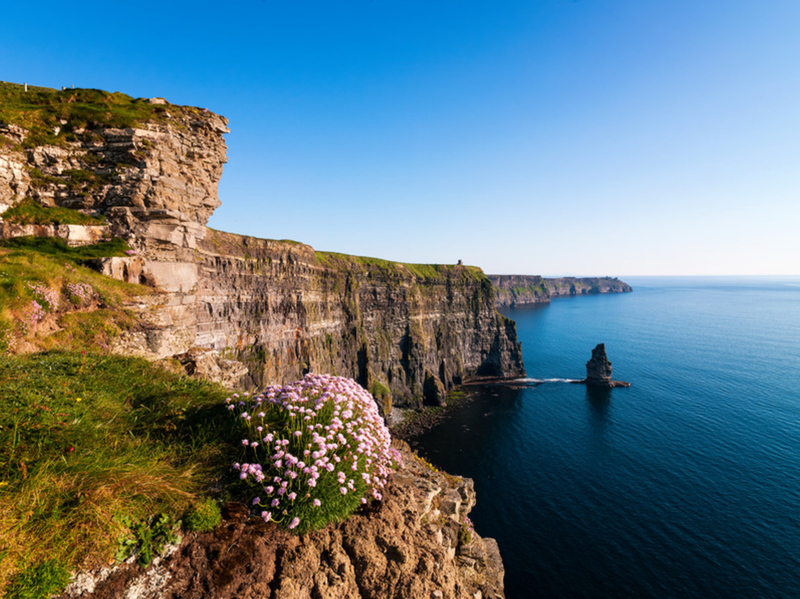 Over the days of the trip, many sites were visited including Ireland’s capital city, Dublin, the harbor city of Galway, natural landmarks such as the Cliffs of Moher, and historical landmarks such as the Blarney Castle. Luckily for the group, the typical Irish fog and rain had dispelled for their trip and according to Andion, even their tour guide hadn’t seen such beautiful weather. Junior Justin Badell’s favorite part of the trip was visiting the Cliffs of Moher. “Seeing the view over the edge of Ireland was absolutely amazing,” Justin said. Nature trails were also incorporated into the trip through the exploration of the Ring of Kerry which highlighted more of the natural beauty of Ireland’s coast. The Ring of Kerry is a tourist route that passes through several towns in South-Western Ireland and this landscape paired with the fortunately good weather really made this an unforgettable part of the trip. All in all, the trip was a success by many standards and those who attended made lifelong memories with new friends. This trip gave the students and staff members involved a chance to experience something uniquely beautiful embedded into the history and attractions of Ireland. The stories the travelers get to tell could truly inspire anyone to visit Ireland and appreciate it on a personal level as they got to do. This was a Spring Break they will never forget.